One of these snack options can go a long ways toward keeping your mind sharp and your attention focused as you wait out the big buck of a lifetime. Deer season is just around the corner, from the warm and humid sits of the early season to the snowy and cold endurance sessions as the clock winds down towards the wintertime finish line. When sitting for long hunting sessions (which can mean all day for many of us during the annual whitetail rutting madness), it's important to have high-energy snacks available to help you stay focused and ready on the stand. For a snack to be a good option for hunters perched in a deer stand, it must be easily packaged and stored in a hunting pack, even easier to access and consume, leave behind no real mess, and be absolutely quiet while it's being enjoyed. If the snack offers a chance to boost energy, and provide a few vitamins, minerals, and fiber, then that's even better. And if it also has a great taste, then you've found a snack that's hard to beat! If there's a perfect snack for the deer hunter's pack, it just might be a package of Old Trapper Old Fashioned Beef Jerky, available online and at a number or retail locations including your local Cabela's store and Walmart locations. Available in 10-ounce clear packaging that harbors regular, teriyaki, and peppered versions of this lean snack option, the Oregon based family business has been turning out jerky since 1969. With no saturated fats or trans fat, this seasoned and naturally smoked jerky contains low cholesterol while packing a nutritional wallop with 11 grams of protein per serving. Add in other high quality choices including beef steak and beef sticks, and there are plenty of pack-friendly snacking options available to deer hunters from Old Trapper. The bottom line is that Old Trapper fits the bill for a great snack, giving deer hunters something to readily munch on while they wait out a big buck. Plus it's a good choice that provides sustained energy, great taste, and comes in an easy to use package that can be quickly resealed and slipped back into a hunting pack when the moment of truth arrives. If there's one thing that most deer hunters enjoy as much — or more — than deer hunting, it's eating their hard earned venison. Unfortunately, that isn't always feasible in a treestand! How can you mix your passion for deer hunting with the great taste of venison? By having your deer processor turn a few pounds of deer meat into a few sticks of summer sausage. From the standard flavor to more exotic blends containing jalapeños, smoked cheddar, or Cajun spices, there are a number of different flavors that can be made. What's more, they can be easily sliced into rounds or bite size morsels, dropped in a Ziploc baggie, and put into a deer hunting pack for enjoyment later on! A snack popularized over the years by hunters and hikers, a bag of trail mix, or GORP (which is said to stand for "good old raisins and peanuts"), is a commercially made — or even homemade — staple in many packs thanks to its mix of tasty ingredients and ease of use. How can you make your own GORP? It's simple. Get a sealable plastic bag and add in equal amounts of your favorite ingredients. Trail mix can be tailored to dietary needs too. Combine heart healthy nuts like almonds, along with peanuts, some sunflower seeds or pumpkin seeds, raisins or dried cranberries, M&M chocolates or chocolate chips, granola cereal, pretzels, banana chips, and even shredded coconut, depending on your taste buds. There are few snacks that I enjoy more than a handful of cashews. Unless it's a handful of almonds. Or pistachios. Or pecans. Or...well, I think you get the picture that I'm kind of nuts about nuts. In addition to being full of protein and monounsaturated fats, most nuts are an energy packed snack option as well as being easy to package and consume. Whether you're wanting to enjoy prepackaged sleeves of cashews, almonds, or peanuts (yes, I know, peanuts are technically a legume), a small can of mixed nuts, or a clear baggie that you've packed at home, nuts are a tough to beat snack option for deer hunters. Easy to carry, easy to open, and easy to consume — there is much to like about energy bars like those offered by Wilderness Athlete and other brands. With good amounts of energy-boosting protein, such bars aren't as cheap as the sugary granola bars you get at your local grocery store, but they usually pack a better nutritional punch. Don't laugh — the snacking staple that my wife once used as she drove our young kids around to their childhood soccer, softball, baseball, and football games is also friendly to middle aged deer hunters high up in a tree. Combining fiber, whole-grain, and limited calories (if eaten in moderation), a cup of your favorite flavored Cheerios is a great treestand snack for dad too. I'm not sure where I first came across this snack option (maybe it was on a western big-game hunt after I had read a story by well known bowhunter Cameron Hanes), but tortilla wraps are a simple, quick-to-consume snack. A few tortillas rolled around a tablespoon or two of peanut butter and honey, a few slices lunch meat with cheese, or even some chunks of leftover chicken, can provide plenty of energy-boosting possibilities. The idea here is similar to the tortilla wraps mentioned above, just in a different package. While bagels can be loaded with carbs and calories, using whole grain varieties can give a hunter a bit more in the nutrition department. While dried fruit is often coated with gut-busting loads of sugar, a small handful of raisins, dried cranberries, dried blueberries, or dried apricots, can be a convenient snack that packs along a bit of nutrition and fiber as well. Another option is fresh fruit. It's easy to carry and you can consume varieties ranging from apples to pears to bananas to peaches and more. Simple to pack, and even easier to eat, a Ziploc baggie filled with Wheat Thins is a snack that is hard to beat, for me at least. It's also a snack filled with some baked whole grain goodness, one that can be nibbled on as you wait on a big whitetail to wander by. Checking in with less than 100 calories, along with sporting several grams of protein, a good supply of calcium, and having limited saturated fat numbers, string cheese is the perfect on-the-go snack to slip into your deer hunting pack. While you might not want to eat a couple dozen packages of string cheese during a hunt, three or four can help curb hunger cravings, provide some protein for your body to work on, and help pass the time as you wait to notch your deer tag. Candy bars — especially the smaller versions you buy in Halloween mixes — aren't the most nutritious snack options available to deer hunters. But they are relatively inexpensive, easy to open and consume, and easily carried in a hunting pack. A tasty and satisfying bite size morsel that can be occasionally enjoyed in moderation, make mine the M&M Peanut or Almond varieties, please. While my dandy dozen deer hunting snack list may not be all that there is, it's a good start at curbing your hunger while giving some energy and nutrition possibilities. 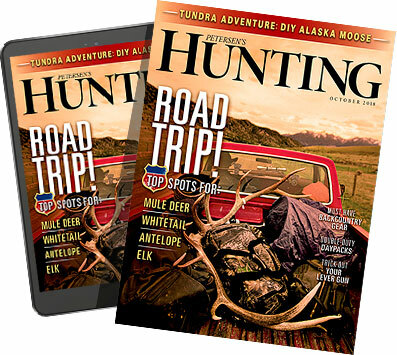 As you climb into your treestands, ladder stands, or ground blinds this fall, why not pack along a bag of Old Trapper Old Fashioned Beef Jerky and a few of these other snack options while seeing if your taste buds — and your growling stomach — don't agree.